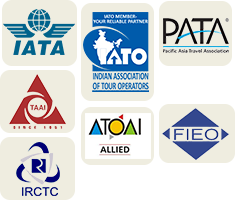 Almost 35 Years committed professional service to global tourists. Recognized by Government of India, Ministry of Tourism. Round the clock service support (24×7). Total commitment, sincerity & dedication. Automated network of own offices & associate’s offices throughout India. Due to good word of mouth many repeat & recommended clients. Goodwill, reputation is a testimony of our Hallmark.